Transportation Costs > How Much Does a Scamp Trailer Cost? 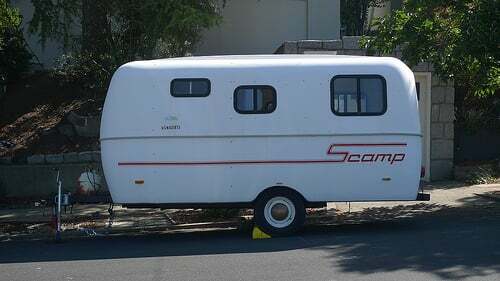 How Much Does a Scamp Trailer Cost? Founded in 1972, these trailers are aerodynamic and are created with a lightweight, hard shell fiberglass that is durable and makes them extremely easy to tow. Depending on the size, the features, the model and where it’s purchased, the costs are going to vary. On average, the prices for a Scamp trailer are going to range anywhere from as little as $2,000 used to as much as $21,500 brand new with all of the premium add-ons included. Like most travel trailers, a used model is going to cost a lot less than a brand new one, and most used trailers will be around $4,000 to $7,000. As for a new trailer, the costs will greatly vary depending on the features and options that are added outside of the base price. Typical new Scamp trailers, according to the many classified ads and dealerships we glanced at, can range from $8,000 to $18,000. For example, the base price for a 13-foot scamp trailer retails for around $8,000 while a 16 footer starts around $11,000. Remember that this is the base price, and as features and options are added, the price will go up. NOTE: These price ranges, courtesy of the NADA Guides, are for the basic models only. If you were to add any premiums, as we dive into deeper below, it can increase the prices by the thousands. CamperFinds.com has ads that range anywhere from $2,500 for a 2003 16 footer to as much as $10,000 for a 2009 13 footer. These are the prices for used scamp trailers, and if you were to click the link, you can glance at the average used priced based on your geographical region. This company was founded in 1972, so the years will range anywhere from the early 70s until now. Most ads on the internet, however, are typically from the 1990s and 2000s. One member on FiberglassRV.com said he was quoted about $15,500 after all the options he wanted were included. Common sizes are going to include 13, 15 (older models), 16 and 19 feet long, which is measured from the end of the tongue to the rear bumper, meaning the length inside is shorter than the specified length. Unlike traditional travel trailers, Scamp trailers are built with fuel costs in mind. They are designed to be towed by trucks, vans and SUVs due to the lighter weight and the aerodynamic design. Weights can range from 1,200 to 2,800 pounds, depending on the size. Floor plans, depending on the size, will typically include a table that converts to a bed, different storage options, a small kitchen, bathroom, shower, closet and a sofa that converts into a bunk bed. Other basic specifications, according to the brochure, includes propane tanks, awning, TV hookup, 120v outlets, water tank, water heater, propane stove, roof vent, curtains, sink, electric brakes, electric supply cord and a spare tire. Premium options, just like an RV, can include a variety of add-ons, including upgrading the air conditioner, appliances, entertainment options, generators, jacks, batteries, awning, electronics, paint, window awnings and more. If your current vehicle does not already have a hitch, this can result in additional fees. SEE: “How much does a hitch installation cost?” Check the specs of your vehicle to ensure that it is capable of towing something this size. It may be possible to ask the seller to deliver a scamp trailer to your home, but you should prepare yourself for the additional fee that he/she may charge you. If you buy new, most dealers, especially if you purchased locally, will deliver for free. Even though the scamp trailer is designed with fuel efficiency in mind, you will still see a rise in fuel consumption when pulling a scamp trailer. While optional, you may want to consider storing your scamp trailer during the winter months rather than leaving it outside in the elements. This storage will be an extra cost, but it may also help keep the trailer in good condition. Make sure that you know what your SUV or truck can handle when it comes to towing. It is advisable to consider a lightweight class because cars with lightweight scamp trailers can drive much easier than cars with heavy trailers. Heavy trailers can also decrease your speed and make it hard to break. Buying a used scamp trailer online can help you save money because some sellers offer lower rates compared to purchasing it directly from the factory. However, if you are going to purchase online, it is so important that you view it in person to make sure everything is in working order. Like purchasing a car, prices are never set in stone. Never be afraid to haggle. 1084 Scamp 16′; floor plan 4. Original equipment but good condition. Replaced roof vent cover and flooring and window covers after purchase.